Who knew it only took 10 days to learn to fly?! 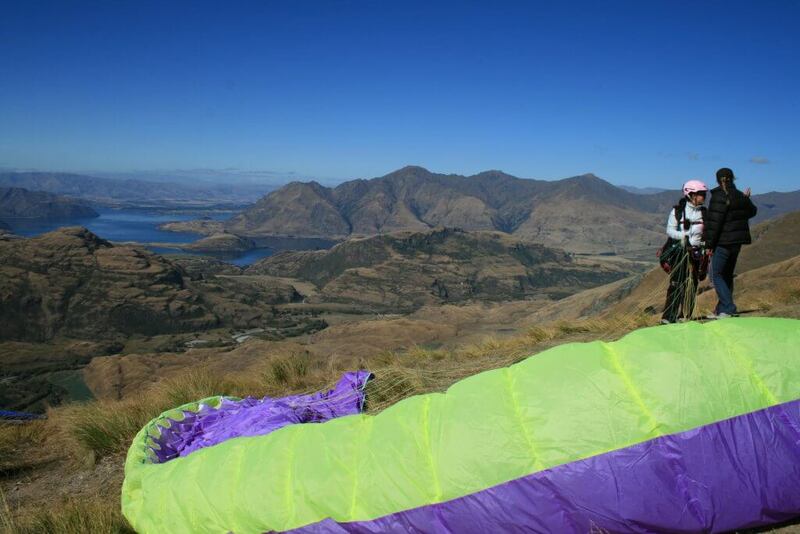 Louise Healy heads to New Zealand’s southern Alps to take to the skies on a paragliding course. The first thing you feel is the wind gliding smoothly over your face. They say that if you don’t feel this, you’re in big trouble. The next thing is the silence. Cruising 4,000 feet above ground, you almost expect noise but it is the most silent, serene place you could ever find yourself. It’s only when something unusual happens – seeing a bird hovering beside you – that you really realise you’re flying. Whilst hiking the beautiful southern Alps in New Zealand I became increasingly aware of bright colours invading the sky. 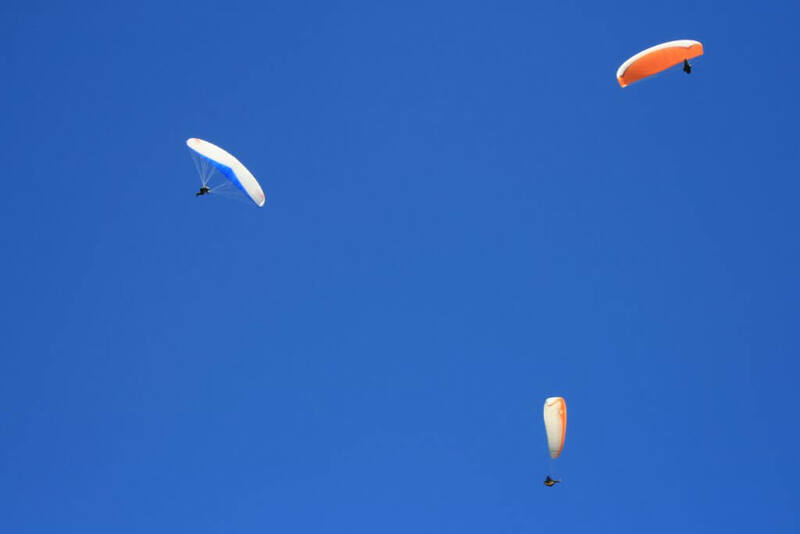 Looking skyward, I would see parachute gliders swirling, their resplendent colours diving and swooping at every angle like powdered paint dye against the blue sky. This was a world of colour and excitement in the air that I knew nothing about. Soon enough I decided I wanted in. 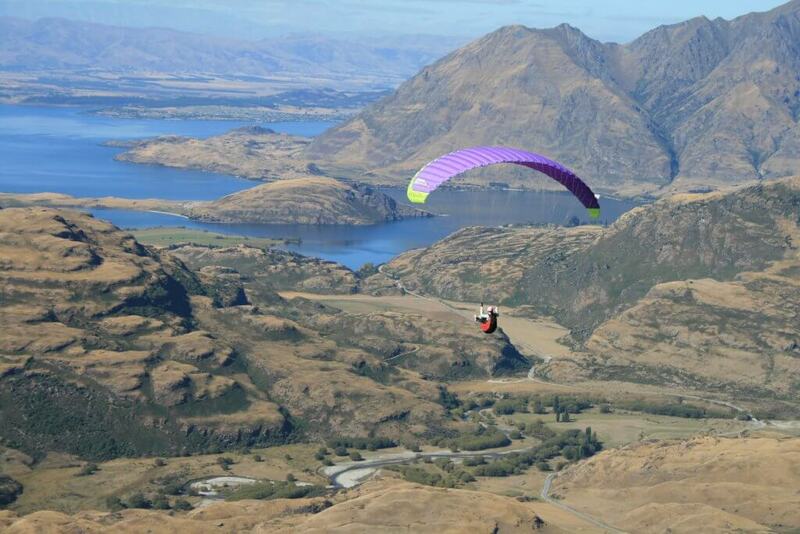 Flying at Treble Cone, Wanaka, New Zealand. Paragliding is not for the fainthearted. It involves running like a mad man off a hill, dicing with the risk of serious injury during flight, negotiating the mood swings of Mother Nature and having the good sense to know when to give up for the day if the odds seem to be stacked against you (because they probably are). It is a sport that takes years to master, but can, with dedication, good weather and a serious amount of patience be taught in a relatively short period of time. Ten days in fact. For me I couldn’t think of a better place to learn than against the beautiful backdrop of Queenstown, New Zealand – the adrenaline junkie capital of the world. 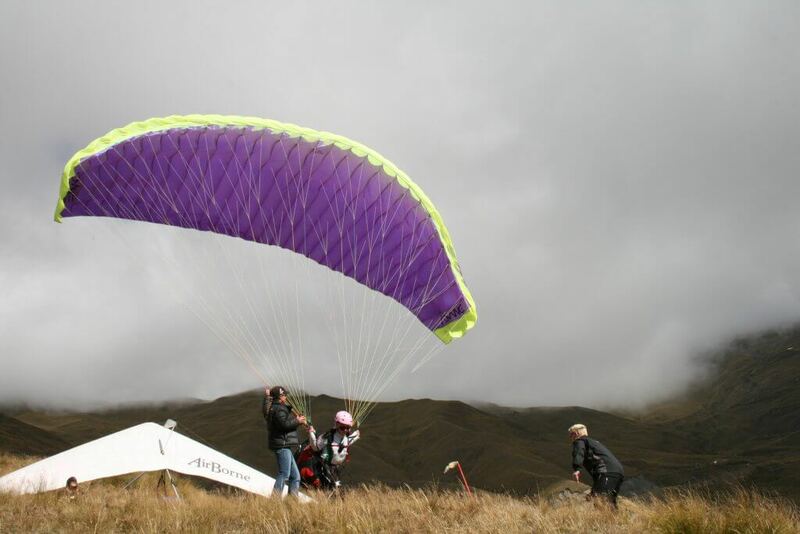 The flight park (the training ground and landing spot for hang gliders and paragliders) just outside Queenstown is set in a perfect location and continues to attract paragliders from all over the world who find the conditions there ever challenging. My induction into the sport was unnerving. To test if this was really the sport for me I was thrust into the thick of it: as a passenger on a tandem flight with an experienced, albeit lunatic of a pilot, performing acrobatic stunts at every swoop, turning the faint feeling of small butterflies in my tummy into a stomach-lurching extravaganza. I quickly became acquainted with the intricacies of the sport and acutely aware that learning to paraglide in 10 days would involve a lot of luck, time, attention to detail and a clear head. People ask about the fear of flying, and how much terror there is gliding hundreds, if not thousands, of feet above ground, but really that’s the easy part. The hardest part of learning to paraglide involves the take-off and landing. If these two areas can be mastered, the rest is the proverbial piece of cake. It is also during take off and landing that most accidents happen. People ask about the fear of flying, and how much terror there is gliding hundreds, if not thousands of feet, above ground, but really that’s the easy part. A bad take off in dodgy conditions or a nasty landing with an unforgiving tailwind can mean the difference between a serious injury and developing the confidence to continue in the game. My Kiwi instructor, Lisa Bradley, one of the few female instructors in a predominantly male sport, made each student do the mandatory hours/flight experience on a small 150ft training hill nicknamed Mount Pain before embarking on their big first solo flight. Training for the big flight. Most paragliding courses for your solo paragliding license (PG2) require about six hours training a day over a 10-day period and involve a mixture of ground training with your glider – which is much like flying a kite: feeling for wind movements and manipulating the wing to fly whilst on grass and 30 plus high flights – before moving on to advanced areas of flying such as reverse launching, ridge soaring, thermalling, B-Line stalls and emergency procedures. Checking lines before take off at Treble Cone, Wanaka, New Zealand. There are also additional hours of theory in the evenings. You can expect to be up on your own flying solo within about a day with all the essential equipment provided like gliders, harnesses, radios and helmets. Participants get their paragliding license 1 (PG1) – an introduction to paragliding, after three days, and then a further seven days of flying and additional hours of theory culminate in an exam that will lead to the award of your International Pilot Proficiency Identification (IPPI) and the PG2. This allows you to fly without being overseen by an instructor. Both are internationally recognised. Understanding the nuances of meteorology is indeed an art, but having the will to learn it and assimilate it slowly is essential for this sport. Learning meteorology and how it can affect flying is an integral part of the course. Acquiring knowledge about wind movements, precipitation, isobars and the like can all get a bit mind-boggling at times, but it’s imperative to know if you want to be a solo pilot and take flying into your own hands. You must learn how to view the wind and the thousands of ways in which it can perform. Summer days you imagine being calm and seemingly perfect for flying can sometimes be the deadliest. Understanding the nuances of meteorology is indeed an art, but having the will to learn it and assimilate it slowly is essential for this sport. Learning about weather patterns and experiencing them also teaches you a lot about nature. In Queenstown, there were days when the wind was howling and blowing dust caps down the valley. As we packed up our gear calling it a day, we saw birds, specifically crows, coming out to play, revelling in the excitement of the crazy weather. Discussing wind movements before take off. The old adage, a crow flying alone is the sign of foul weather, rings true. On a number of occasions when there was gusty winds and ominous black clouds above, we spotted them again, coming out playing in the air, dancing in the high winds. They go out to get tossed and thrown around the air, but seemingly enjoy it and always go back for more. So usually when you spot a crow out bobbing in the air it’s a sign of a bad weather front coming in and probably not the best time to go flying. But as a beginner, flying will only be done in perfect conditions, usually in early morning or late afternoon. You usually need to have completed around 40 flights to comfortably gain your solo pilot paragliding license (PG2), and while the course takes 10 days to complete, if weather conditions are not in your favour or you need more fine-tuning, instructors are happy to carry on teaching at no extra cost until you’re happy. Not being able to sleep the night before and dreaming of pulling non-existent emergency reserves, I spent the wee hours of the morning with my head stuck into the Art of Paragliding manual with a slow sense of panic on the horizon. So after days of running down training hill slopes with 15-second airborne flights in the bag, it was time to do my first solo flight off Coronet Peak, one of New Zealand’s most famous ski field mountains. Not being able to sleep the night before and dreaming of pulling non-existent emergency reserves, I spent the wee hours of the morning with my head stuck into the Art of Paragliding manual with a slow sense of panic on the horizon. I arrived at the take-off spot bleary-eyed at 6.30am to embark on my first solo experience in the sky. Early morning flights are usually the perfect time to fly for beginners, with smooth and stable air. Generally, weather conditions are the most forgiving at this time. Despite being overcome with the usual pre-flight jitters, by the time I got rigged up into my harness, completed my line check and was standing staring at the brightly coloured windsocks waiting for the wind to blow up the hill in my direction, an almost surreal sense of calm washed over me. As I took my first steps that progressed into a run and felt the glider lift slowly up over my head, I knew it was going to be a success. Running off the hill and still running mid-air (which is a sight in itself), I gently sat back into my harness, pulled up my breaks and marvelled at the wonderful, awesome scenery surrounding me. The exhilaration was addictive and I quickly packed up my gear and went straight back up for flight number two. With no one else in the sky at 7.30 am, and long before the commercial tandem pilots start, I looked around at the beauty of Queenstown, the majestic Lake Wakitipu and the undulating hills heading towards nearby Arrowtown. The Remarkables mountain range lay before me and for miles all I could see were patchwork hills and groves, like something straight out of the Lord of the Rings (the Remarkables are instantly recognisable as Mordor from the films). And it was then that I sensed the complete silence of flying. Although I was hooked up to a radio to my instructor, she remained quiet to allow me to really take in everything about my first solo flight and afford it all the blissful serenity it deserves. The landing was easy as it was planned and well rehearsed, from viewing the landing field before the flight to having prepared a number of different landing scenarios. The exhilaration was addictive and I quickly packed up my gear and went straight back up for flight number two. Halfway through the second flight, a bird cruised by me. I looked at it. It looked at me. I laughed and said, “Hello, it’s a wonderful day for flying, isn’t it?” Then I realised I was talking to a bird. I giggled, looked around and got my bearings. I was alone in the air, 4,000 feet above ground and away from everyone. Magic. I looked again at the bird. I was just glad it wasn’t a crow. 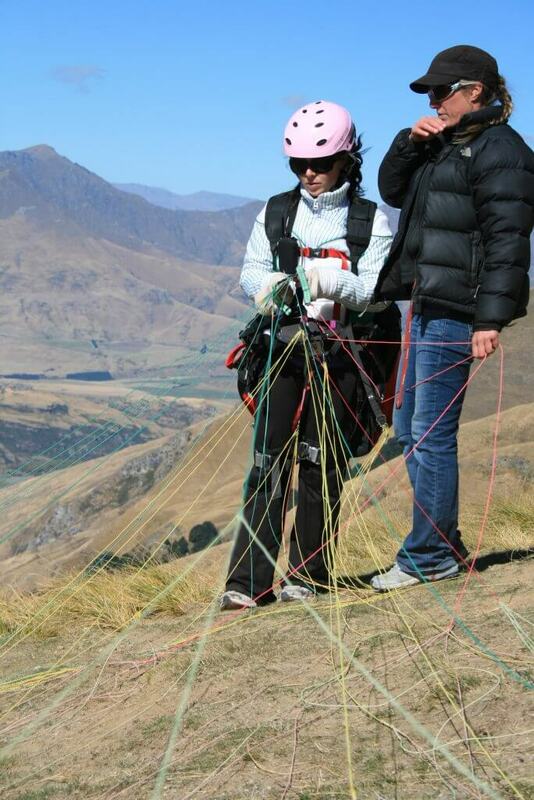 The 10-day course costs NZ$2,000 (€1,323) which includes all equipment – gliders, harness, radio and helmets. I’d recommend allocating 14 days for a course like this to cover eventualities of bad weather making it difficult to fly. 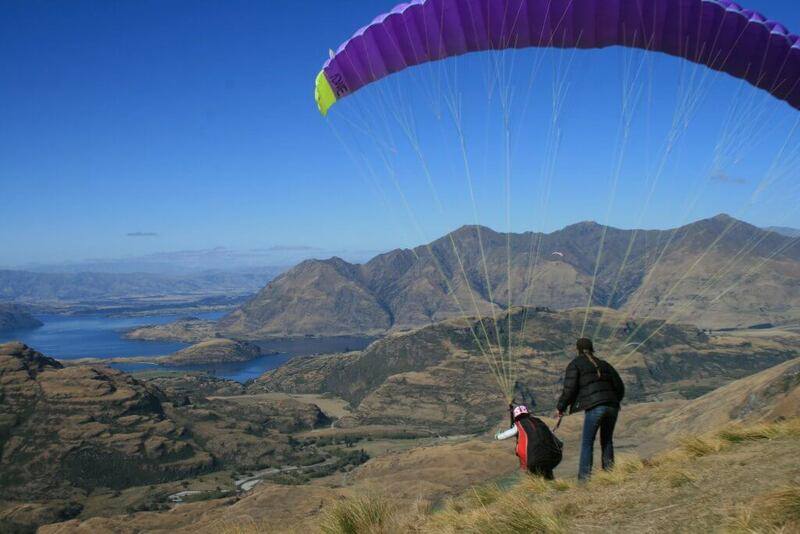 Mid-summer (from December to March) is usually the best time to learn in Queenstown when hot weather conditions are perfect for paragliding. For more information contact Extreme Air Queenstown. In Ireland, the Midland Paragliding and Paramotoring School provide 10-day courses at €150/day for club pilot’s license (the PG2 equivalent). 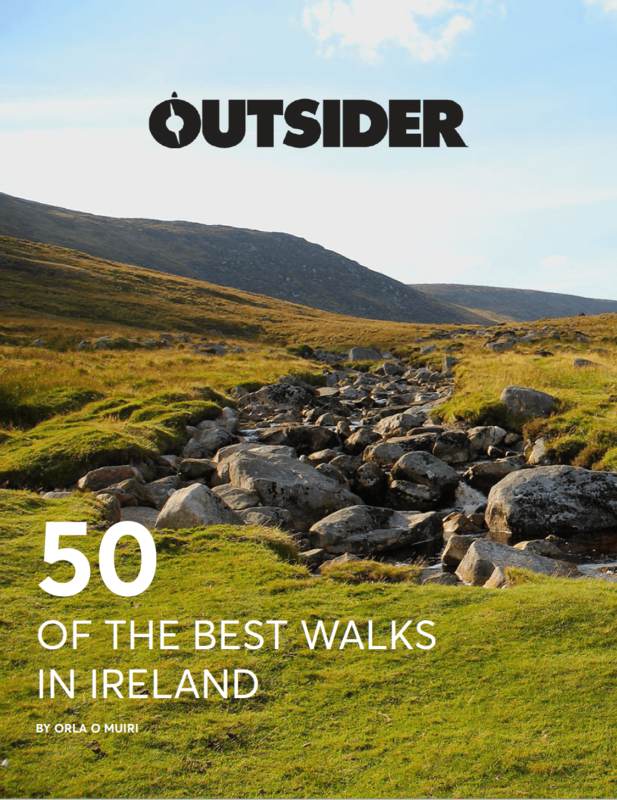 The school runs most of its training courses in the Comeragh Mountains in the Clonmel/Waterford area. For more details, contact Midland Paragliding and Paramotoring School, tel. 086-2232955. Make sure to have adequate insurance cover before embarking on a paragliding course. Sturdy footwear, i.e. boots, specifically made for paragliding/hang gliding or alternatively a good pair of hiking boots with ankle support. It’s also advisable to bring a pair of lightweight, thermal gloves as your hands can get cold and stiff during flights.